6. Listening to SARA ZARR speak. Here's a recap of her speech on the SCBWI blog. The part that really moved me was hearing Sara say she missed the kind of writing that happened when she had nothing at all to lose. When no agent, editor or bookstore had her book yet. When she just wrote for the pure and all-consuming JOY of it. Because after that, the stakes suddenly become higher. Remember that very first time you opened a blank Word document and just started writing? 7. Laughing hysterically during RL Stine's speech. He is so dang funny and self-deprecating. And I have a stack of his books from my teaching days that I can't wait for my son to read! When he's brave enough-- MWUHAHAHA! 8. Brunch with my agent. We met me at my favorite breakfast place in the East Village. It was a richer experience than talking on the phone, and I'm so glad we made it happen. 10. John's Pizza in Midtown. One of my favorite pizza places in NYC! Love Sara Zarr's comments. I'm definitely enjoying my side of the fence with the (almost) lack of pressure. I didn't sleep well during the last LA conference. I looked wasted for days until my body finally gave in to the welcoming bed. Isn't it funny how we yearn for solace- the king bed all to ourselves- but when it arrives, we are restless, needing the comforts of home and family? I'm like that too...never can sleep when my hubby's out of town. By the way, that pizza looks delicious! That hotel room looks incredible! The whole trip must have been so much fun. Especially breakfast with your agent! That sounds like a wonderful experience all around. I'm so glad you got to go. Thanks for sharing. That pizza looks AMAZING. I'm jealous of all the fun you obviously had. 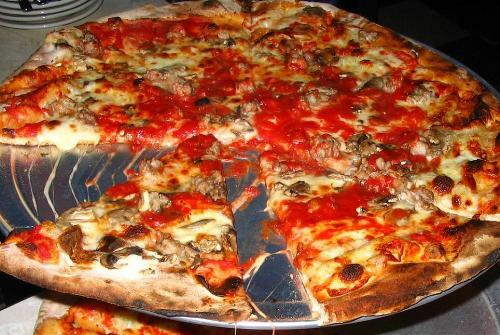 That's amazing that you had lunch with your agent and that pizza looks absolutely delicious! YUMMY! Loved RL Stein as a kid! Would've loved to hear him speak :) And the pizza....Mmmmm good! It's funny, but I never have pizza when I'm in the city. I should make it a point to have a NY slice next time. Oh how I would love to try sleeping alone, no alarm, no kids. Just once. You lucky girl! You are living some cool stuff! Delicious pizza, cool hotel rooms and brunches with agents! You go, girl! Uh! Beyond jealous of you seeing RLStine! Childhood literary LOVE! Glare. Glad you're having an awesome time! What a great experience you had! One of these days I'm gonna go. Miss you and can't wait to see you published!